Fruity meets earthy, meets cuddly. Rich enough to nourish, but also quite refreshing. 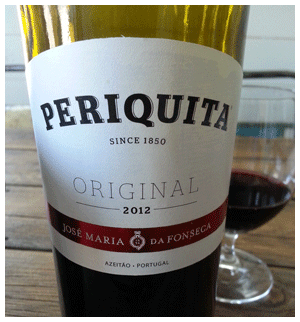 This Portuguese classic has been refitted to appeal to the Shiraz age – while still keeping a measure of authenticity. And its great-value rating. Obrigado! P.S. I believe we will be seeing the white mate of Periquita sometime this summer. Tasted it on our Lisbon trip and it’s delish. And speaking of… ONLY SIX SPOTS LEFT for our September tour to LISBON. Read about it here.